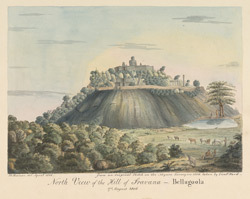 Water-colour by John Newman of the hill of Shravana Belgola, with a statue of Gommatesvara, dated 17 August 1806. Inscribed on front in ink: 'North View of the Hill of Sravana-Bellagoola. 17 August, 1806, from an Original Sketch on the Mysore Survey in 1806, taken by Lieut Ward. J.G. Newman del. April 1816.' ; Lieutenant Benjamin Swain Ward, son of the solider artist Francis Swain Ward, was one of MacKenzie's assistants on the Mysore Survey. Shravana Belgola is one of the most famous Jain pilgrimage places in southern India. The site is dominated by the huge monolothic image of Gommateshvara which represents Bahubali, the son of the first Tirthankara who renounced the world and obtained enlightenment after defeating his brother Bharata in battle. It is the largest free-standing sculpture in India, standing 58 feet high; the saint is represented naked and immobile, his glance fixed ahead. The erection of the monolith in 981 was patronised by Chamundaraya, a general of the Western Ganga dynasty. The statue stands on the Vindhyagiri hill that rises 143 metres above the plain south of the village. The site was established in the 9th-10th century and continued to be developed under the Hoysalas and later during the Vijayanagara and Wadiyar periods.